If you understand the climate in Prague, it will make it much easier for you to plan your trip. Details on a short term forecast are available online, but a longer term forecast based on climatic trends will give you a good base on what to expect in each season. Prague is actually known for its weather extremes so be sure to pack accordingly and be prepared in advance. 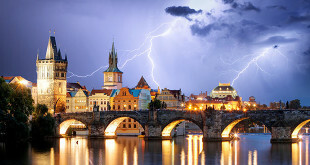 The city of Prague experiences a continental climate that is greatly influenced by weather patterns coming in from Siberia to the east and from the Atlantic to the west. In fact, the city is also known for its extreme weather from brutally cold winters to hot summers. In between, the weather is pleasant in both the spring and fall months and therefore, this is usually the best time to visit the city. While the average temperatures are the warmest in July and August with average highs of approximately 23 degrees Celsius, it is not uncommon for temperatures to climb to 35 degrees over the same time period. Winters can also be cold with temperatures getting as cold as -15 degrees Celsius on occasion. Snow is actually rare in the city, but it can happen. Overall, Prague will receive 525 millimeters of precipitation over the course of a full year. This precipitation is fairly evenly distributed over twelve months with the wettest time coming between May and August. The winter months are generally a little bit drier. 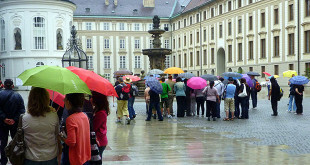 No matter when you visit, you will want to have either rain gear or an umbrella with you just to be on the safe side. Tip: Cheap door-to-door Prague Airport Shuttle service recommended by lonely planet. For weather forecast please click here. Useful tips before you go – tourists traps etc. Spring is considered to be one of the best times to visit Prague since the weather is mild and not too hot or oppressive. In addition, the city’s numerous gardens are in full bloom and the hotel rates are still very reasonable. The weeks in early spring might still be chilly, but from mid-April until May, the weather will only continue to get warmer with each passing day. Summer in the city can be oppressive with highs climbing to near 35 degrees Celsius on occasion. Summers can also be oppressive with high humidity values from June until the middle of September. While some of the residents head to cooler regions, there is still plenty to do during this time as tourist destinations are open late and many restaurants have areas where you can sit outdoors and enjoy the warmer weather while enjoying dinner and a drink. However, afternoon rain showers are common so keep an umbrella with you late in the day. Autumn is also one of the best times to visit the city of Prague. The brightly colored trees offer spectacular views and the days are usually still filled with sunshine as this is one of the driest times of the year. The end of the season can start getting cold, so early fall is generally the best time to visit. This can be a good time to visit the city if you don’t mind the cold weather. The crowds are usually much thinner and visitors can get good deals on airfare and hotel rooms. November can also be a good time to visit before it gets really cold and the snows begin to set in. The weather in Prague can be highly changeable over a short period of time. It is advisable to take a rain jacket to account for any sudden showers. The summer months are typically the wettest so definitely keep either a jacket or umbrella during this time. However, if you forget your umbrella, there is always a restaurant or café nearby that you can duck into. If you plan on traveling to the city in the summer months, be sure to take shorts and short sleeved shirts to account for the heat and humidity. If you travel to the city in the winter, be sure to take plenty of sweaters, long sleeve shirts and heavy jackets to keep you warm against the chill. For both the spring and fall months, dress in layers to account for quickly changing conditions. No matter what time of the year you visit, be sure to pack comfortable shoes as you will be doing a lot of walking to see the sights. If you suffer from breathing problems such as asthma, it may be a good idea to visit Prague in a season other than the summer. That is because the pollution in the city can lead to bad air quality during the summer months and can make breathing quite difficult. If you have issues, be sure to have your inhaler with you at all times. My wife and I (seniors) are deciding whether to visit Prague during the first half of april or late april-early may. We’re trying to balance cost against weather. Some good advice would be appreciated. Thanks very much. The start of febuary can be very cold pack warm clothers a good pair of hiking shoes as a lot of ice on the ground we went last year at start of febuary last year Take thermols with you as well.Enjoy we are going back in febuary as well but a couple of weeks in. Hi, we travel to Prague every year in March and although it’s cooler weather, it’s better than heat of summer. We are seniors as well and we can highly recommend staying at the Best Western Hotel Metropole on Hybernska ul. You are right in the centre, yet it’s quiet, their breakfast (included) is excellent and you can walk from there everywhere. It’s clean and the staff is the friendliest! You can also speak English everywhere as most of people speak several languages. Do not exchange money on the street or little exchange shops!!!!! Bank or hotel is your best choice. Bring good walking shoes and rain jackets. Have a great trip. I’m planning a trip to Praque next week 26/7. What will the weather be like? I’m coming from Cyprus and the temperature reaches at 43 degrees here!!!!! What’s the weather like in Prague during the early/mid part of April? hi. prague weather in march very changable. i was there during march.sunny one moment blizzard the next.still worth the visit.food exelent.lager 10 star. trams very good. beware the taxi!!! enjoy. My boyfriend and I have planned to go to Pargue at the beginning of Feburary, does anyone know what sort of weather we should expect? Also, is there anything out of the city that should not be missed? we will be there for 4 days. I’m thinking of going to Prague in November. I don’t mind if it’s cold, but will the sun be out much? I need to know how’s the weather in March. Me and my fiancé will spend 4 days there and we’d like to be well prepared! Hi! I love Prauge and I´ve been there a few years ago when I was 13. Me and my best friend are going there for a week around 1:th of November. Can you please tell me what the weather´s like? How cold/warm is it? Does it rain a lot: average, how many days in the month? Are there still leafs on the trees, or are most of them gone? The perfect timing would be to travel to Prauge in the autumn in the very end of the summer. I don´t really care about how cold it is, as long as the weather´s good. Thanks! The weather at this time is getting colder – expect highest daytime temperatures of around 5 to 8 Celsius. The days can be grey, seemingly without end. Pack a warm jacket. The city will be less crowed, and autumn in Prague is also a very nice season for a visit. What will the weather be like end of november begining of december? Beginning of December can be quite cold so dress up warmly with plenty of layers. Weather during that time is usually around 0°C to 5°C, sometimes wet mud and occasional snow. My husband and l are going to Prague in Early November and l was wondering what the weather is normally like there at that time so that l can proprely prepare clothing wise for our trip. l would appreciate your comments please. Will arrive prague May 10. Do I need jacket? What are weather conditions in general, during may? Will I need to layer? I’ll be in Prague in the 1st week of May. How will the weather be? I’ll have 2 days free (Mon 2nd and Tue 3rd May) to do some sightseeing. Am interested in attending a music concert or a musical. Can anyone advise? Hi I am looking to visit Prague the very first weekend in November – what sort of weather can I expect and is this a good time to go? I am planning a trip to Prague in Nov. What will the weather be like? This year’s winter is very mild. The average high is 2°C and average low -2°C, which are temperatures comparable; days are short and it gets dark before 5 pm.The average precipitation in December is less than 25 mm and can be in the form of snow or light rain. Prague winter weather can be quite crisp and you will be happy to put on gloves, a warm scarf and a hat. Packing warm clothes is a good idea. Make sure your feet are kept warm in sturdy winter boots with a water resistant sole. Avoid high heels if you can if you plan to do a lot of walking in Prague. me and my friends are going to Prague on the first week of April.is it normally rainy on those days?and can you please give best places to visit? What is the weather in Oct. and early Nov. in Prague? looking for someone who has been in Prague from Oct 31 thru Nov 11. What was the weather during that time period? It can get quite cold and may even snow. My husband and I are going to be in Prague for one week in early April. What sort of weather conditions can we expect. Also, what are some of the ‘must see’ and ‘must do’ things. Do you think Cesky Krumlov, is too far to travel for a day trip. Is it worth going there?Any tips v much appreciated. Prague is an amazing city!! Yes, of course, city centre, Old Town Square, etc etc are the must sees, but do be sure to venture out of the centre, you’ll find delight and wonder everywhere! It’s hard to tell what the weather will be like after this winter. As you may know by now, Europe is in the throws of a very very cold snap. With this being said, I would prepare for winter jackets for that early in the month, and of course there would be the possibility of snow. Hopefuly the very very cold will have dissipated somewhat by then. I used to live there for several years and now live in Sunny warm Florida. I am going back at the ned of March for about 3 weeks to visit old friends. It’s a wondereful city with wonderful public transportation, and I am sure you will enjoy your visit. I am visiting Prague in early January next year, What will the weather be like? I hope it snows. I want to visit Prague on 4th to 8th Nov 2011; what will the weather be like? If I visit Prague beetween the months of January and April, will a lot of the clubbing scene be closed for the winter? Actually the clubbing scene is not much affected by seasons, except January and February, when it is off-season. You can expect that some city centre clubs which cater especially for tourist groups will open only on selected days, usually Wednesday, Friday and Saturday. My family is planing to Europe during end November, I do not know how weather in Prague, I went there once during summer, I like there very much and this time I will bring my gril together. Do you think is very cold there during end November in Prague and other countries in Europe? Give some advise. Thanks. I am visiting Prague and would like to pack accordingly. We will leave on September 12, 2011. What might the weather be like around that time? Any suggestions for what to pack? I need to travel light due to baggage limitations. The weather in mid-September is mostly warm, and you should be able travel light. Expect daily temperatures around 15 to 20oC. I have been Prague in Mid September, the weather was not too cold. You may need only jacket. But there may be raining. I am visiting Europe for the first time – seeing Prague! – and would like to pack accordingly. We will leave September 16, 2011. What might the weather be like around that time? Any suggestions for what to pack (not too much, as I plan to bring some things back with me)? My husband and I are planning to stay in Prague 26th-30th December. Please could you advise whether most budget hotels will have good heating and what the outside temperature/weather will be like? Also, are most attractions open during this period? Hey, I am visiting Prague all month of July. What will the weather be like. Also I would like to know how can i get around and how much will it be for me to get to the airport and back from Masarykova Kolej Thákurova 1 and Opletalová 26? Any ideas?! 4 of us are coming to prague the second week in may – will it be cooler or warmer? The weather in May will be glorious. CR is like any other country in Europe, you pop your visa card in the machine and it gives you local currency..depending on who you bank with will depend on how much you pay in charges. I am planning my first trip to Prague on the 1st March 2011, with my 1 year old son. Is there anything I should know beforehand when taking a baby on my own? What weather can we expect? Hi, my husband and I went to Prague in march 2010 it was very cold lots of snow on the ground went to -15 at night take warm clothes and a hat you will need it. Go to the castle and the square lots of shops there not bad prices. You can eat anywhere so many restaurants all with great food. Have a great time. will places accept us dressed for the weather. Hello all, am visiting Prague March 23 – 28 to attend Young Prague International Musical Festival with the Bahamsa National Children’s Choir. Any suggestions to what type of locthing we shall trave in and with. Also what is the temperature like at about that time of the month/year. We are really looking forward to the festival and visiting Prague. There are about 40 in our group. During this time highest daily temperatures will reach 15°C and occasionally even up to 19°C. But weather will be changeable with some occasional showers. My family is going to Prague on 25 Dec 2010, any advice on the weather? is it too cold & walking difficulties or we should cancelled our trip, your comments. pls can someone advise abt the weather? I am planning a trip to Prague between 31st march and 6th april 2010. I have a 7 month old baby with me. Please advise if it will be too windy/cold? what kind of clothes should we pack, especially with the baby. Also, will it be too crowded due to Easter? Any other pointers will be much appreciated. my husband and i are going to prague on 18th feb 2010 and we are staying at Maxmilion hotel and was wondering if you think it will be very cold /snow and do you reccommend dressing up or down when going out at night. This year January in Prague is extremely cold and meteorologists expecting that those weather patterns will last until the end of February. When going out at night definitely take worm clothes, around mid of February temperatures can be around minus -3 C to -8 C (in the late night hours or early morning). I will be travelling to Prague on 22nd January,2010 for one week. Please advise me on the weather implication. Especially if it very cold. Yes there is a snow in Prague at the moment (24/JAN/2010) and it is expected to be snowing during upcoming week beginning of 25th JAN. So I would definitely recommend pack some very warm clothes. Just for example today, temperatures reaching up to minus 20 C. Just today there were two deaths of homeless people because of this serve weather conditions. In Prague it can be quite warm during summer months but never too unbearabley hot with average temperatures around 20°C, higgest daily temperatures around 27°C to 32 °C. hi, my husbie and I am leaving Miami heading Prague this Saturday. Is it too rainy? We are staying at K&K Central? Any comments on that? Any suggestions on how to get to the hotel? I’ve been reading a lot on different website, but we only have 3 days in Prague….not enough….I know….but that’s what we could get…Being that I have only 3 days…what is a MUST? It’s our 50th anniversary. Going from Oct. 21st-30th or so. Weather OK for my husband (w/heart history but pretty good)? Hotel Ambassador-Zlata Husa OK? Back and forth from Budapest same day, or less time in Prague and more in Budapest? Really appreciate your answers and suggestions. I am an artist and we live in the city now so love the energy of cities. Thanks so much. Hi Shelly, I believe the weather will be fine for your husband, though at the end of October it can get cold so you should take warm clothes with you (temperatures around 0C at night, and around 8-12C during the day). Hotel Ambassador is a very nice hotel situated in a convenient location in the heart of the city, with many shopping passages, arcades and malls around. If you wish to visit Budapest from Prague it is a good idea. Both cities are nice, and are very similar in many aspects. From my personal view I would suggest spending more days in Prague and two or three nights in Budapest. Prague city centre is more compact and easier to walk around compared to Budapest which is more spread around. If you plan to enjoy some river cruising, Budapest is a better place than Prague. My boyfriend and i going to Prague in mid November, what’s the weather and temp like in mid november? We trying to figure out how much money to spend daily (exclude hotel),, we would love to go for a nice dinner and go to really nice club.. Very useful information. I had not realised that the rainfall was greater in summer than winter and this rather narrows the choice of visting times for me.